Despite writing horror and contrary to popular belief I had quite a good childhood. So now again something resurfaces… In this case Top Cat and he’s looking good considering his first show dates back to 1961. A new police chief unhinged and unhappy with officer Dibble frames Top Cat. Top Cat goes against his most craziest foe. Hanna-Barber’s prime time animated television star Top Cat returns in his very own movie. Where as Yogi Bear (2010) was put in a real environment and had an awful CGI makeover, makers of Top Cat thankfully stick close to his animation roots. The New York computer backgrounds plates have a hyper-real feel with the characters and gang a 2D flash-animated style similar to Dexter’s Laboratory. Opening with the original styled Top Cat theme and a rework of the opening tricks and scams it oozes nostalgia. It has all the fun of the original cartoons albeit a little stilted at times. Choo-Choo, Brain, Benny, Spook, Fancy-Fancy and Officer Dibble are all present and correct even if Dibble is a little lighter here. Packed with cons, robot police, gags, quips Top Cat is still the leader of the gang. Survivors of an aeroplane crash find themselves close to government testing area, pursued by predators they get picked off one by one. Another Blare Witch, Paranormal Activity, REC, Zombie Diaries to name a few camera style POV film. Despite an impressive created crash site set, CGI ‘dinosaur’ effects and young Abigail Schrader’s acting, Tape 407 is average at best. It’s packed with annoying screaming, shaky camera, bad make-up, sub- par performances and a painfully predicable ending. Where as the likes of the mediocre Grave Encounter’s made sense to have a camera at all times this falls short in logic and execution. I’m sure the production and crew worked extremely hard and it may have worked better if conventionally filmed. That said, it still would have had the short falls previously mentioned. Yeap, I’m a geek, I loved Spider-Man, Stan Lee’s great creation as a child was my favourite. It was great to have Sam ‘Evil Dead’ Raimi at the helm to bring the character to life in (2002). However, I was let down by it’s gloomy nuance. It lacked the entertaining, wittiness of the comics, cartoons that even the dated 70’s films and series captured. I’m hoping The Amazing Spider-man (2012) will put it right. So when there was a new flurry of Marvel films (this time with budgets) I didn’t have very high hopes especially as The Hulk already had to be made twice. So here are a few thoughts on The Avengers and a few of the films that lead up to Assemble. Nick Fury of the organisation S.H.I.E.L.D., recruits Iron Man, Captain America, the Hulk, Thor and a few others to form a team that must stop Thor’s brother Loki from enslaving the world. Marvel’s The Avengers (in the UK named Avengers Assemble possibly not to be confused with John Steed and Emma Peel, who knows why?) is a surprisingly satisfying superhero film. While the previously named characters film outings almost shamefully set this one up writer and director Joss Whedon manages to pull the styles of the other directors together in this feature ensemble. While its not essential to see the other films it’s does help to fill in some gaps. The music score isn’t particularly memberable but heightens the on screen action accordingly. Where as spider-man reeked of quick cuts and a cgi replacement, Whedon and team manages to keep Avengers comic book action integrated, accessible and visually coherent. Notably Mark Ruffalo replaces Edward Norton as Hulk/Banner and sits quite nicely with top cast that includes Robert Downey, Jr., Chris Evans, Chris Hemsworth, Scarlett Johansson, Jeremy Renner, Stellan Skarsgård and Samuel L. Jackson. A few sub- character also return. The story isn’t overly complicated and sticks to a bumper issue Marvel edition. The film doesn’t try to overly deepen the characters and stays close to the comic book spirit and roots. 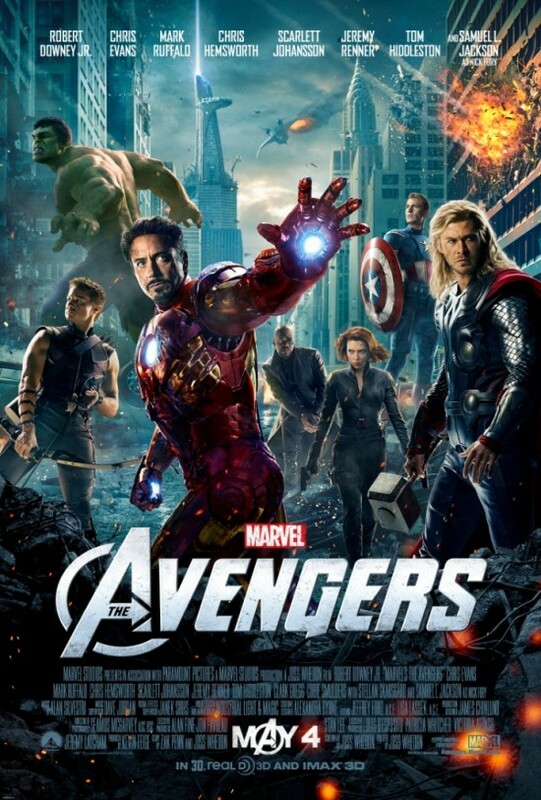 Packed with one liners, top effects and great comic book characters The Avengers ticks all the boxes that arguably some of the stand alone prelude films didn’t manage to do. Regular Joe, Steve Rogers is a bit on the weak side but a medical experiment makes him taller, stronger and faster. At the height of WWII Rogers is shipped to Europe to raise morale and he ends up going head-to-head with the ‘Hydra’ Nazis. Director Joe Johnston handles the period piece well, the American and European locations with a mixture of great set design and effects to fill in the background are fantastic. With artistic licence the time and feel is captured wonderfully, however, the modernistic look of certain weaponry is an unnecessary distraction which takes you out of the moment. It possibly should have been used sparingly for the bombs that are integral to the plot. Nevertheless, the special effects used to make Chris Evans thinner and of smaller stature are outstanding, a real achievement. That said, some of CGI action scenes fair-less well under scrutiny. In the first third of the film Johnston manages with the aid of the screenplay to tease out a few questions about war, individual hopes and moral issues. 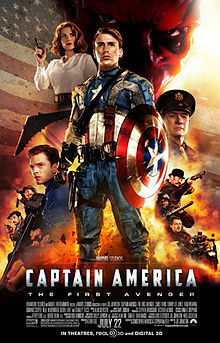 The majority of the film is set at the peak of World War 2, which oozes patriotism but fans or anyone familiar with Marvels Captain America maybe disappointed with the lack the hero coming to terms with a modern environment or any present day plot or contemporary showdown with The Red Skull. The First Avenger: Captain America is at its most interesting when Chris Evans is Steve Rogers humble self, going through his army training then later finding his purpose. There’s some well written humour, the segment of the promotion tour of America to rally financial support of the war is complete with a dance number and showgirls which is highly entertaining. Writers Christopher Markus & Stephen McFeely to names a few contributors give some great lines and setups. Hugo Weaving is superbly cast as the Red Skull. Finely tuned Skeletor-like make up with an odd eeriness of Michael Jackson captures The Red Skull perfectly. Sadly, Hugo’s talents are underutilised and he is given few dialogue scenes or interaction with his nemesis, leaving him pretty much your stereotype villain. Notable is Capote star Toby Jones as Dr Zola, the Skull’s sidekick. Tommy Lee Jones steals every scene as Col. Chester Phillips but Dominic Cooper is a welcomed surprise as Howard Hughes-alike, Howard Stark, who is of course father of Tony Stark a.k.a Iron-Man. Hayley Atwell as Peggy Carter is first rate perfectly fitting to the time period with her looks. Dry, subtle and warming is Stanley Tucci as Dr. Abraham Erskine who underplays the character excellently but is sadly missed for the most part of the film. And of course no marvel film these days would be complete without a cameo from Stan Lee. Even more so than Iron Man, Hulk or Thor the closing really pushes S.H.I.E.L.D and the scene, plus preview after the credits reaffirms the need to push speedily to The Avengers rather than integrate it coming together slowly through sequels. Which is a missed opportunity. Chris Evans is adequate as Captian America, and thanks to a grounded, even performance he oddly fits. Disappointingly we never get to see a modern ‘traditional’ Captain America costume in this, again another annoying draw to see The Avengers, when a Captian 2 would have been more desirable in the first instance. The First Avenger is more fun during it’s first half, with a good mix of action and drama. But the second half stumbles becoming a borderline predictable sci-fi rather than comic superhero as the script is thrown out for all out action. A god, Thor is exiled from Asgard to Earth. However, he must find a way of returning to stop his brother Loki becoming the new king of Asgard. Chris Hemsworth as Thor is very good portraying his arrogance and later insecurity perfectly. Tom Hiddleston is notable as Loki and plays it less maniacal with range. Hopkins picks up his pay cheque but in his defence there’s not much he can do with Odin’s dialogue and costume. Both Stellan Skarsgård and Natalie Portman are sadly wasted but actors playing the Warriors Three; Volstagg, Fandral and Hogun are endearingly fun. Despite being directed by successful thespian Kenneth Branagh Thor at times feels like souped up CGI Supergirl (1984) and Superman 2 (1980). It’s not as much fun as Iron Man but despite some alterations captures the Thor comic book spirit arguably more successfully than the last 3 Spiderman movies. Naturally Thor is effects driven and the story has a little more depth than most recent comic book adaptations but the earth bound periods are rather uninspiring while the enjoyment comes from the action on Asgard. 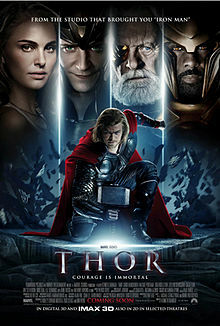 It’s good entertainment especially if you are a fan of Thor, but all the special effects add up to something very forgettable and feels like a vehicle simply for The Avengers film. Overall, it ultimately depends on what your idea of what a comic-book superhero movie should be. Tony Stark reveals his superhero alter ego identity and while resisting calls by the government to hand over the Iron Man technology he finds himself threatened by a new enemy. I’m happy to say there’s not much to dislike about Actor/Director Jon Favreau’s excellent follow up to 2008’s blend of comic book action, humour and effects. 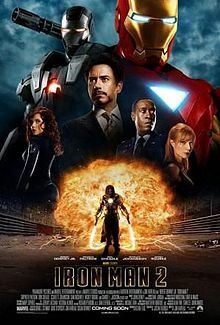 Iron Man 2 picks up where the first one left off, as billionaire Tony Stark must contend with the government, his own friends, as well as new enemies played by the wonderful Sam Rockwell and the perfectly cast Mickey Rourke. Thankfully Scarlett Johansson replaced Emily Blunt and looks great as the Black Widow, although the costumes cuffs looked a little out of place. Don Cheadle unnecessarily replaces Terence Howard as Lt. Col. James ‘Rhodey’ Rhodes but is just as good, phew! The leads; Gwyneth Paltrow surprisingly cast in this role returns and is the grounded back bone of the film. Robert Downey Jr. once again is fantastic as the witty extrovert Stark. There’s lot of emotion as you see Stark’s father and a glimpse of their relationship. Downey’s acting captures Stark’s battles with his mortality and his alter ego fittingly. The effects are well executed and don’t detract from the action or story in anyway. Fans will enjoy nods and references including The Avengers, Captain America and Samuel L. Jackson’s second Nick Fury cameo, to name a few. Again there’s a great script and storyline that zips along at a nice pace backed by a fitting music score and rock tracks. Personally, I feel it’s better than Iron Man due to it’s sharper editing and sleeker look. Stick around until after the end credits as there is a nice teaser of another superhero.